Cupcakes have been replacing the traditional cake when at a party. They’re self-serve and allow for a lot of creativity, as well as variety in flavor. But how can you display them in an attractive fashion? When my son turned one, I decided to not only make cupcakes to celebrate, but also to create my own DIY cupcake stand. I pulled this off by using cake circles, foam cylinders, and soup cans that I decorated with scrapbook paper and ribbon. Here are some other fun stands that you can make at home. Little Red Window did something similar by creating a DIY Cupcake Stand using Styrofoam disks and soup cans. It’s amazing how easily these can be dressed up with some scrapbook paper, ric rac, and ribbon! 365 Days of Crafts has a Mermaid-Themed Cupcake Tower that is easily created using stacking box lids for the trays, small terra cotta pots for the tower, and Olyfun for the scalloped edging. Also included is a cute starfish headband if you want to help the star mermaid with her costume. Maybe you don’t need as many layers in your cupcake stand. It’s really easy to make one out of a dinner plate and a candlestick. Thrifty Jinxy shows you how to make this inexpensive DIY Cupcake Pedestal Serving Plate. Another quick and easy project is the DIY Cake Stand from Mom’s Messy Miracles. Here, she shows you how she made a cake stand from a pizza pie tin and a pretty mug. So simple and inexpensive, yet so attractive! 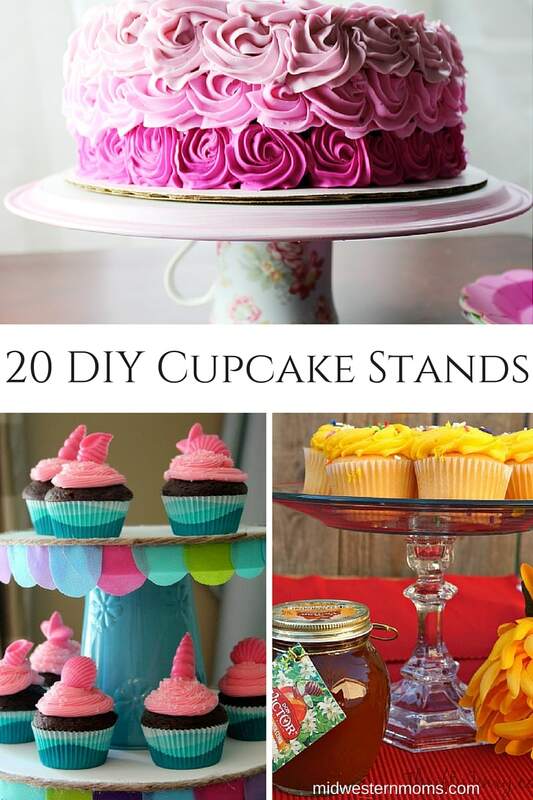 It can also double as a cupcake stand as you arrange your cupcakes around the top of it. Or, instead of pizza pie tins, try decorating burner covers that you find at the Dollar Store, like Simple, Sweet, and Southern did in her Dollar Store Serving Tray. Sarah on the Blog made something similar, using serving platters and candlesticks from the Dollar Store to make her Spring Trays. One or two coats of spray paint is all it takes to make them pop with color, and they dry quickly! Another quick and easy version that looks similar to these are the 5-Minute DIY Candlestick Cake Stands by Poppy Talk. These are created from wooden candlesticks and wooden plaques that are then painted in your chosen décor. Take this idea a step further, like Consumer Crafts does with their Personalized Cupcake Stands. Add a letter, such as someone’s initial. Or, you can even spell out a special message with the letters in the middle of your display, using solid-colored ones for the rest of it. Or, instead of using candlesticks in between layers, follow Cake Central’s example and fill wine glasses with pretty items. Then, stack plates or trays on top of those, like in this Beach Themed Cupcake Tower. Along a similar vein, you can easily create one of these Rainbow Cupcake Stands by My Suburban Kitchen, using wooden bars and mason jars that you paint and glue together. Those would be quite sturdy! Life a la Mode classes things up by gluing small, round mirrors to the bottoms of wine glasses and turning them upside down for individual cake stands. You can group a bunch of these together or use them throughout the display to add some height, while keeping more cupcakes on regular trays. Have an extra set of hands? A rectangular Cupcake Tower is a great way to display several dozen cupcakes at a party. Crafty in Crosby made theirs out of foam board from the Dollar Store. You’ll want those extra hands to assist during assembly, but the end result is quite lovely. For the sports lover in your life, consider this Baseball Cupcake Holder from Finding My Yellow. They cut a maple bat into three parts and circles cut from plywood. Absolutely adorable. And you will likely need an extra set of hands to get this one started, as well. Do you like to get your hands dirty with power tools? Over at Shanty 2 Chic, they built an incredible DIY Shanty Cupcake Tower that took them one afternoon and only cost $15 to make. If you’re handy with wood and tools, you can also make your cupcakes portable while sharing a fun cupcake display with this DIY Cupcake Tray Carrier created by That’s My Letter at Pretty Handy Girl. And then iHeartNaptime has created a terrific trash-to-treasure item by taking an old chandelier found at Goodwill for $5 and turning it into a beautiful DIY Cupcake Stand for her daughter’s birthday party. After cleaning it up, add some plates or wood pieces, paint it, and trim it. Just gorgeous! The Knot shares another fun upcycle with this Rustic Wooden Ladder Cupcake Table Display. Clean up an old table and small ladder. Using the ladder in the corner on the table allows for height to enhance your display. Shabby Sweet Cottage re-purposed some wooden trays from Goodwill by repainting them and then using the wooden candlestick technique to create a unique Stacked Trays Cupcake Stand. Not feeling overly craft or short on time? A simple solution is to follow Smart School House’s example for a colorful DIY Cupcake Stand. Buy inexpensive goblets at the Dollar Store. Fill the bottoms with candy and then top them off with your beautiful cupcakes. Some may even enjoy that extra sweet treat underneath! Which one do you want to try for your next celebration? Thank you for sharing my cupcake tower. Nice collection of ideas. Hey Devon, you’re right, cup cakes are the best alternative for a picky crowd. They however lack the grandeur of a cake and a cupcake tower really helps bring in that lack of aesthetics. My favorie is the Cupcake Stand from Little Red Window.